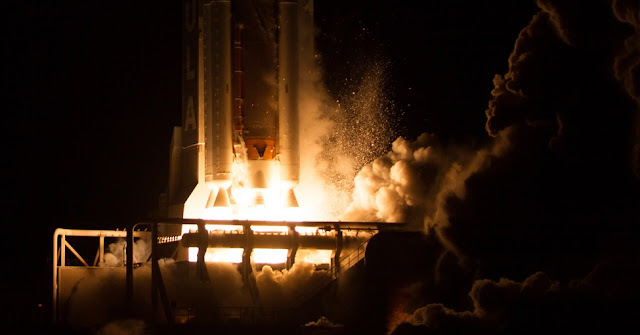 United Launch Alliance successfully completed another major milestone in the completion of the U.S. Air Force’s Advanced Extreme High Frequency (AEHF) satellite system. The fourth of six planned AEHF satellites lifted off at the very opening of a two-hour-long launch window at 12:15 a.m. EDT (04:15 GMT) Wednesday, Oct. 17, 2018. As is the case with all East Coast flights of the Atlas V, the satellite began its journey to space from Cape Canaveral Air Force Station’s Space Launch Complex 41 (SLC-41) located in Florida. The AEHF constellation of spacecraft is being sent to orbit so as to provide increased and improved performance in terms of battlefield communications. Clear skies along Florida’s Space Coast greeted the launch with weather having no impact on launch operations. Forecasts had predicted a 20 percent chance that the Sunshine State’s weather might interfere. With the five meter fairing required for the AEHF-4 spacecraft affixed atop, the Atlas V used for tonight’s flight stood an impressive 197 feet (60 meters) in height. The rocket is a veteran in terms of its service with the early-morning mission marking the 79th time it has taken to the skies. Three seconds before leaving the pad to begin the AEHF-4 mission, the Russian-made RD-180 engine ignited and began burning its fuel of RP-1 (a highly-refined version of kerosene) and liquid oxygen. When combined with the five Aerojet Rocketdyne-produced AJ60A solid rocket boosters, about 2.5 million pounds of thrust was unleashed at SLC-41. Their role complete and their propellant expended, the solid rocket boosters were jettisoned about 1 minute, 50 seconds into the flight. About 1 minute, 40 seconds later, the Swiss-built (Ruag Space) payload fairing was no longer needed and was also jettisoned, falling away back to Earth. Largely unnoticed, the component that connects the payload fairing to the Centaur RL10C-1 upper stage remained attached for about five seconds after the payload fairing had been jettisoned. Just shy of 4.5 minutes after it had left the pad, the first stage’s main engine cutoff took place. Six seconds after that, the first stage separated from the upper stage followed shortly thereafter by the Centaur taking over the task of powering the satellite on its way to orbit. Unlike the first stage, the Centaur upper stage burns a mixture of liquid hydrogen and liquid oxygen. The Centaur’s first burn last for about 7 minutes. It would not activate until the mission had reached an elapsed time of about 22 minutes. This second burn would last about six minutes. The third, and final, burn for the Centaur upper stage’s engine is expected to take place some 3 hours, 28 minutes after liftoff and last about 1 minute, 40 seconds. Should all go as planned, at about 3:47 a.m. EDT (07:47 GMT), the AEHF-4 satellite is expected to be deployed in its initial orbit of about 4,813 by 19,060 miles (7,745 by 30,674 kilometers), inclined by 12.8 degrees. “This is a substantial milestone for AEHF, and as we look ahead, we continue to improve and upgrade this mission to deliver these vital communications capabilities to the Air Force,” Mike Cacheiro, vice president of Protected Communication Systems at Lockheed Martin said via a statement issued by the company. As the spacecraft’s nomenclature denotes, there have been three other spacecraft that have already been deployed. AEHF-1 (USA-214), AEHF-2 (USA-235) and AEHF-3 (USA-246) were launched on Aug. 14, 2010, May 4, 2012, and Sept. 18, 2013, respectively. Each satellite was built by Colorado-based Lockheed Martin.